There are a lot of messages that are commonly spread around when it comes to locksmiths, some of them are true while others are not. Here is how to keep your home and business premises safe as recommended by experts. Previous house owners, including their family and friends may have access to your new home. To be on the safe side, always change the door locks whenever you move into a new home. Having a window near the door can give an intruder easy access into your home since the glass can be easily broken and a hand used to turn the knob. To avoid this, have a double cylinder deadbolt lock installed; this ensures that a key will have to be used to open the door even from the inside. Point to note though is that never leave the key in the door, instead tuck it away safely away from sight. Hollow doors may be more pocket friendly compared to sturdy doors, however they pose a bigger security risk compared to sturdy doors since they can be easily kicked in. This is why you should invest in a strong door and a strong secure lock. Locksmiths don’t have key copies. Some people think that locksmiths keep copies of keys just in case you need an extra one. This, however, is not true and there is no need for you to worry about this. Deadbolts are very secure, but only if they are installed correctly. If you hire unqualified locksmiths they may end up doing a poor job which puts you at a risk in case there is a break-in. You certainly don’t want to call a quack into your home. There are many scammers out there who just want to take your hard earned cash without them delivering quality services. Go for locksmiths who are qualified and reliable. Most people hide their keys under the mat or near flower pots. These places are not only obvious, but they also give intruders easy access to your home. Avoid being a victim by not hiding your door keys within 10 feet of your door. Considering the value of the items inside your home, it is safer to invest in a quality lock. Quality locks guarantee better protection from break- in’s compared to substandard ones which are cheaper. This is why most qualified locksmiths will recommend certain brands based on their experience. If you have any questions regarding anything lock related, then do not hesitate to call our experts based in Centurion on 087 551 0660. They will not only answer any questions you have regarding locks and keys, but they are also masters in safe opening, rekeying, lock repairs, car lockouts and home security upgrades. All their experts have years of experience in the business. They are available round the clock and will deliver quality yet affordable services to you when you need them. 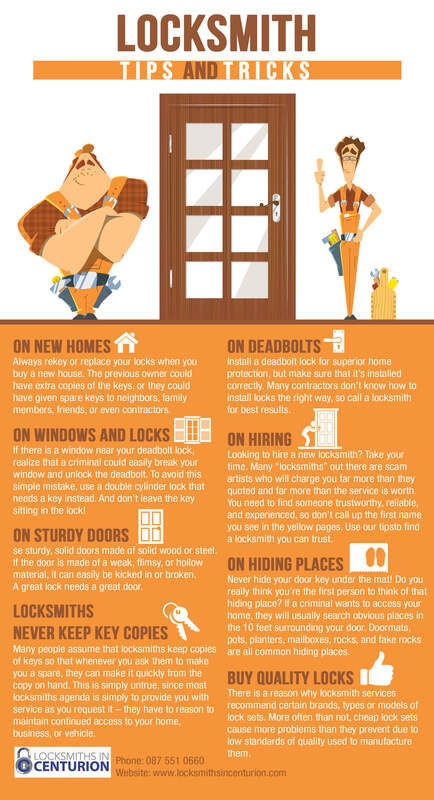 Feel free to request any of their services by visiting their website at http://www.locksmithsincenturion.com/ and get some of the best deals in town.